Please note that these are verified customer reviews, and are for informational purposes only. People sharing their experiences with Organic Sulfur should not be used as a basis for self-diagnoses. It is against regulations for any company to make medical claims for any health products, under FDA law in the United States. Therefore, none of the products offered for sale on our website are intended to be used in the treatment or mitigation of any disease or condition. MSM is good for lots. I have an inflammatory, dry eye condition, not to mention lyme disease. This was recommended by a friend in my lyme support group. For me it has worked far better the medicated drops like Xiidra. I'm just reading more about MSM and realizing how much its good for! Great stuff! I've been making my own beauty products for years, so was eager to try these, its been a few weeks of use, and I can say liquid MSM is truly great for skin, and my hair is loving it too, much softer and healthier looking. I just started adding to drinks in the morning, and after 3 days, I do feel far less fatigue than I normally do. I have also been using this on my daughter's psoriasis with aloe gel and it greatly reduced her patches and itch. I have been using for detox and energy, happy to say it's been working well for both. Energy levels are actually fantastic since using these in my am smoothes and afternoon tea. I have been using it lately for some toners and skin products I'm making at home, just experimenting with that, and have not seen the difference there yet but its early. My eyes are now a bright white and feel great thanks to this product. Takes a few weeks to do its thing but works very well. Just remember they sting a bit on contact but goes away quite fast. I read its the MSM uptake into the eye membranes that causes the initial sting. I have also started adding the drops to my midday tea, and am finding my afternoon drowsiness has been greatly diminished, in fact feeling very energetic! These drops have been very good for me so far. I am using them in my skin toner and a cellulite gel, and both seem to be having a great effect in little over 2 weeks of use. My dad is using for his eyes and has also found good relief from his chronically dry eyes. They are quite useful and am next going to try using for my dad's arthritis as MSM is supposedly excellent for that too. My friend recommended these at one of my Doterra get-togethers. I have been adding to my oil and beauty concoctions for past 4 weeks, and there is a true difference in the impact of my oils since started using. I'm actually more excited about the beauty products I'm making with the drops. The eye serum and the skin toner have been working wonders in just a few weeks of use - amazing! Ok I'm officially surprised. These drops give me a great feeling of energy. I add them to my morning smoothie. My hubby is using for his screen fatigued eyes, he also is giving them the thumbs up. I am adding this to my skin toner next, these drops are quite the little toolkit. I bought these for the detox and chronic fatigue, the MSM detox tea is my new favorite. I feel invigorated after taking it, the MSM seems to really help with my fatigue. I add more then the recipe calls for. I'm a believer just ordered again :). Have been great for my eye dryness, redness and fatigue, there is a few seconds of sting while the drops get absorbed no biggie. I have been adding to my conditioner, and hair is much softer and thicker. Also made the Eye Aloe and MSM serum, and its true much better than the $80 Clique eye cream I have used in the past. Love these drops. Have been adding this to a lot of things from my Thieves oil blend, roller balls, morning smoothies. I do feel much better daily energy, and we have not had one cold in the house since I purchased this, which is a miracle in itself with 4 kids. My dad is trying it for his eye floaters and already has seen a difference. Great stuff! Great for eyes, bit of sting. This has really done a lot for my dry eyes, and floaters after just 4 weeks. Its not the only thing I use for my eyes. There is a little bit of sting that lasts about 5 secs one I put in my eyes from the MSM and saline I assume. See a huge difference in my skin since adding this to my protocol. After several months of using your product morning and evening, I am pleased to report noticeable improvement in the condition of my nails (stronger) and skin appearance (more healthy looking if that makes sense). Most importantly there has been a great reduction in annoying eye floaters. Your product has proven to be a blessing. I first ordered the MSM Crystals but found it an extra morning activity to dissolve in hot water; however, my friend tried the crystals with me and loved them-so I passed them to her. I switched over to the drops and now I faithfully use them everyday for inflammation and idiopathic neuropathy. 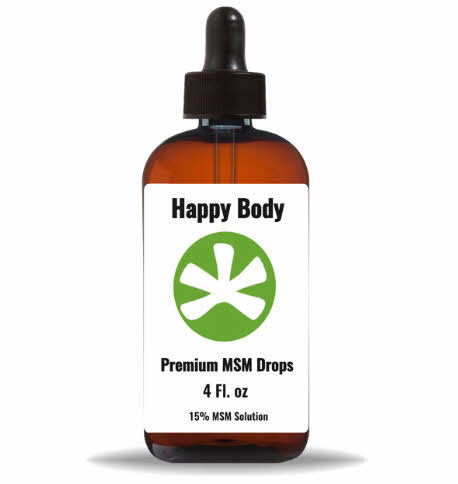 Happy Body MSM definitely helps me with both. I started noticing the increase in energy after the 3rd day. I am so pleased with these results. I have experienced some detox symptoms. They have been mild and only lasted one day. I will definitely be continuing this product. Not only have I had outstanding results managing my severe RA with your MSM crystals, my 11 year old dog has been less than sure footed and slowing down a bit in recent months. He has definitely shown signs of his former, active, happy self after a few weeks of using the liquid sulfur in his water every day. I was afraid he would reject it as he has always been fussy about things in his food or water (like medications), but he drank it right up! So from both of us, THANK YOU for this miracle stuff called MSM. We both enjoy a better quality of life because of it. Was very skeptical about all this, so before I bought turned to good ol Google. Did a lot of research, and was very surprised to learn what MSM can do, and this company gets solid reviews. Decided to try, and happy I did. A lot of essential oil sage's on the web seem to use MSM in their various concoctions with great success. I am already seeing a lot of success with hair and skin recipes. Will keep using, and am looking forward to winter when I can try in different wellness recipes. Shipping was very fast, and company sent good info email with tips and the recipe guide. Am quite happy with this purchase. Very Good! But can sting a bit for eyes. I was intrigued by the research I did on eyes and MSM, so I bought a bottle, I have had worsening floaters which my docs believe are related to my T2 Diabetes. I also have had skin issues off and on for really the last 30 years. Eyes, these sting a lot when you first put in. goes away fast though, and in last few weeks already seeing a difference in my floaters. I have been using as a skin toner as well, and am seeing a general better complexion overall, in the last few days, that is really intriguing for me so I will keep using for both. Thank you for your review Anna. The drops can have a minor, quick sting based on the area of topical application. That sting should go away with in seconds. Glad you are seeing success, let us know if you need anything at all! My daughter is using for her acne and in 2 weeks of use, she is seeing the majority of her acne clearing up. We use a pretty simple recipe I found on Pinterest: 4 Tbsp - Jojoba Oil (organic, unrefined jojoba oil) + 10 drops - Frankincense Essential Oil + 20 drops - MSM Liquid + 5 drops - Lavender Essential Oil + 5 drops - Jasmine Essential Oil (optional). Rub on an night. So far quite impressed with these and will be making more recipes. I have been using these drops for my eyes, they are like a great product my dad used to use called Eyebright. Im using for dry eyes and general eye fatigue. So far the difference has been very good! They sting a bit going in, im told that is the MSM on contact with the eye membranes, it goes away in seconds. My eyes do feel very refreshed and I am not having the neck pains and headaches. I have also started to add to my green tea addition, and look forward to even more results.